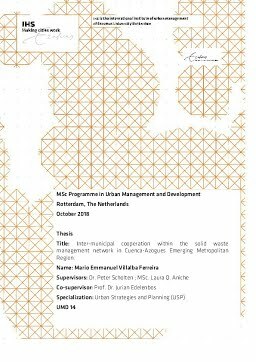 Erasmus University Thesis Repository: Inter-municipal cooperation within the solid waste management network in Cuenca-Azogues emerging metropolitan region. Inter-municipal cooperation within the solid waste management network in Cuenca-Azogues emerging metropolitan region. Municipalities are becoming spatially, socially and economically interdependent with their neighboring territories, leading to the emergence of metropolitan regions. The “metropolitanization” of a territory adds complexity to the social, institutional, and interorganizational dynamics because it increases the interdependence among different stakeholders from more than one municipality. To deal with this new scenario, a different degree of collaboration among stakeholders might be necessary. Scholars have studied intermunicipal cooperation (IMC) in North American, European and Latin American contexts as a mechanism to increase economies of scale, improve service delivery and promote regional coordination and economic development. However, most studies have focused on consolidated metropolitan regions with populations of over 5 million inhabitants while intermediate cities and emerging metropolitan regions with fewer inhabitants have received little attention. Studying IMC in emerging metropolitan regions helps to explain how stakeholders interact within existing network arenas, such as the solid waste management sector, and how particular factors influence their cooperation arrangements and outcomes before the complexity of the territory demands urgent yet suboptimal solutions. While cities face a plethora of urban challenges such as pollution and climate change, the agglomeration of people, institutions and ideas also increases opportunities for cooperation and innovation in urban management. Highly densified cities often have greater chances of achieving economies of scale, which are factors that reduce the average cost of providing urban services such as waste management. For this reason, municipalities managing highly populated cities might be able to collect enough resources to provide services on their own and be financially sustainable. However, in the particular case of small and intermediate cities, which in general terms are not the main center of urbanization and investment within a country, the agglomeration factor might not be as sufficient for having economies of scale that would allow them to deliver complex services efficiently. Inter-municipal cooperation is a public administration solution that has helped small and intermediate cities achieve economies of scale and better results in service delivery. Further, there are multiple forms of IMC and not necessarily all types of arrangements might result in similar outcomes. This brings opportunities for academic research to contribute to public policy at the inter-municipal level through a careful analysis of the factors that lead to successful IMC levels. Understanding the factors that lead to different IMC levels helps to explain why some municipalities choose to cooperate in particular ways and not in others. Analyzing to what extent these differences result in better or worse outcomes could help create policy on promoting the factors that lead to favorable IMC arrangements and avoid the factors that prevent their success. This thesis contributes to expanding the knowledge on this research field through an embedded case study in the emerging metropolitan region of Cuenca-Azogues (CA-EMR) in Ecuador. While most literature on IMC indicate economic and demographic characteristics of stakeholders as factors of IMC, this research indicates that leadership, network management and common ground play a stronger role on IMC levels. Furthermore, comparing sub-cases, findings indicate that higher IMC levels lead to better content outcomes from the Integrative Sustainable Waste Management perspective.